Brexit and bombs: what european are you? What a saint are you? For professional reasons, I cannot express personal views on the outcome of the referendum in the (one) United Kingdom. I risk a yellow card. Since June 23 in certain quarters no other topic is discussed. Yes, because whether we like it or not, the referendum vote shakes the system's roots, recreating anxieties of gone-by times. The Man Without Qualities by Musil is the work that often comes back to the minds of many. The inexorable crumbling of the Astro-Hungarian Empire is an all too obvious similitude, including the role that the establishment took, so busy to celebrate the jubilee of Franz Josef rather than to recognize the signs pointing not only to the end of an empire but also to the bloodiest war in human history. 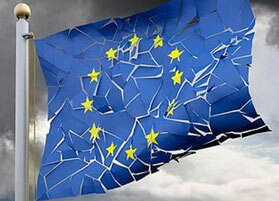 Before attacking the governments of the European Union and its Member States, we should thus try to understand the world we live in, what its evils are, their causes and possibilities to remedy them. Wars, famine, migration crisis, desertification and environmental disasters, abuse and violence, deadly trafficking, poverty and extreme inequality, epidemics, what else? We are under siege, and dare I say it like never before, for the simple reason that never in history have world's ills had size, in aggregate, similar to those of the contemporary world. What most worries are the links between the evils of today; we're all atoms of a huge ripple effect that can explode at any moment (and the fuses may be already on and next to the detonator). It is however difficult to establish a unique causal order. One needs only look to Nigeria; in the Niger Delta corrupt exploitation of oil resources destroys the environment, agriculture, fishing and engenders intolerable inequalities. In the Lake Chad region, desertification destroys traditional resources, creating extreme poverty which in turn feeds violent movements. In South Africa, the wounds of a violent past are used to justify kleptocratic policies that in turn generate waste, increasing poverty and conflict. Easy to look at someone else's house (I mean sub-Saharan Africa). 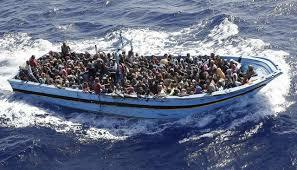 Disorder has penetrated Europe and nobody wants or knows how to speak of causalities. In a world of consumption, bureaucratic certainties, the summer holidays and technological progress what has gone bad? How is it that we cannot cope with insecurity, immigration, poverty and growing inequalities? An increasing number of citizens feel abandoned, afraid, angry. The system has become the enemy and the problem. The government, the European Union, the so-called elites are not only responsible for the evils of our time; they must be eliminated, both as a way to punish them and because with these people here can be no future. I mean, it may be true that the so-called governance of the European Union and its Member States is showing serious shortcomings, and many so-called reforms are unsatisfactory. It is not clear though towards which alternative protest movements are taking us. Or rather, I wonder if people realize the proposal and structures that lie behind these movements. Think of the Front National. They attribute all evils to the betrayal of the national idea; according to them we must close borders and defend the native soil with autarkic policies and militarization of the borders. Our neighbors should not interest us that much; Indeed, should they bother us too much, we should be ready to react with muscles and guns. Down with diplomacy, vive la France! Well, this is the world from which we have tried to move away during the last seventy years, or since the end of World War II which was the daughter of that world. The European idea is precisely created to give precedence to the reasons of dialogue and, let's face it, compromise over the reasons of violence and war. The creation of a common market and common external policies we should have made more united and stronger, transforming the traditional hearth of Europe in peace flame wars around the world. We really resigned to: so much worse so much better? And why? My thoughts in these days are rather aimed at what we can (and perhaps should) do to awaken the hearts of Italians and all Europeans in order to discover the reasons and instruments of a shared future. The effort to understand, study, information, education have an important role to play. I speak not of one hour a week of civic education; in the present state I believe all, parishes, schools, sports groups, associations, businesses, families in particular (the blessed social formations of Article 2 of the Constitution) are called to devote sufficient time to study, research and screening of information and the development of ideas. It's not cool to talk about duties, but in order to avoid the worst, I think we should talk again of duties of citizenship. Study, education, the sharing of ideas in the social groups are duties because, without those, freedoms and rights become a dead letter. Without love for the community, in other words, we all become loose cannons, paranoid junkies in need of ever-growing consumption. A re-found citizenry may become the lever of the change and optimism we need. I know, these are trite ideas. The Italian Constitution is all too clear on these points. The Church's social doctrine has repeated these things for centuries. The challenge still persists unabated. And there comes the Pro Sactitate Movement, because holiness, not of one but of many, is the goal to be attained, the battle that does not disappoint and that, humbly, will make us see and experience the true Good. 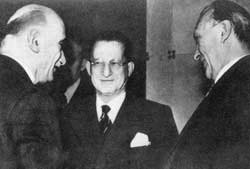 The founders of Europe (Schuman, Adenauer, De Gasperi) were all engaged in a journey of holiness. Which Europeans have we become?